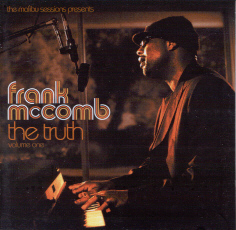 Listening to Frank McComb's album "The Truth Vol. One" artists like Steve Wonder, Donny Hathaway or Curtis Mayfield come into mind. Frank McComb is an excellent pianist and a charismatic singer. His first noticeable appearance was as a musical director for the R&B group Rude Boys, subsequently backing DJ Jazzy Jeff and the Fresh Prince (better known as Will Smith) in the studio. In 1994 he played with Branford Marsalis on his jazz-rap fusion project Buckshot LeFonque. His first solo album "Love Stories" was released in early 2000. Although that was not the first stuff he recorded. He was signed to Mojazz Records but the album he recorded there was shelved. "You Don't Know What Love Is" was a song he recorded with Marilyn Scott for her album "I’m In Love Once Again" (Release May 2003). Now he is back with his new album, which will be released July 7th in the U.K (Expansion Records). The album starts with the love song Shine. A tasteful attempt of approach to a young beautiful lady with a shy attitude. Frank McComb smoky vocals have a high worth of recognition. The funky song is perfectly tailored to this singer and immediately ignites a flammable interest. The tune has a length of more than 7 minutes, enough time to let the feelin' grow. Watcha Gonna Do revives the flashback mood to good old Stevie Wonder. If you don't know Frank's music, it's really easy to think it's he, Stevie. Not only the similiarity of Frank's voice is phenomenal but also arrangement and instrumentation. The love is standing in the center of Frank's interest as proved on Never Letting Go. Remarkable Luis Van Taylor on flute with reverb and echoes building a waving soundscape. On Do You Remember Love Frank plays intensively Wurlitzer Piano and Moog creating the dense atmosphere of Steve Wonder's music. Human relationship is also the theme of Fools. "Some are wise, then there are fools. Life has a way of changing things and the wise will learn while fools think it's oh so funny." This worldly wisdom is presented in a funky way. This time with the support of a Fender Rhodes piano combined with wah-wah effects. A classical interpretation with Grand Piano (Wayne Linsey), Harp (Lori Andrews), Cellos, Violas and Violins (Mark Cargil) intensified the impression of When You Call My Name and Frank's incredible voice. Friends of Hammond B3 will like Action Speak Louder Than Words. The Hammond player is no other than Billy Preston. Frank plays the Wurlitzer piano. Frank's vocal variety is phenomenal. Only a live version of this song could overtrump it. Cupids Arrow is pointed straight to our hearts. As all other songs Frank has affecionately made an arrangement with many details and grace. On Better Off Without You Frank's natural timbre stands anew in the limelight. Frank knows to sing and the love song stands in the centre. A vocal treasure is also the slow Intimate Time. Paulhino Da Costa shows some nice percussion effects of exotic nature straight ahead from the jungle. Shine is added as a bonus mix. This song has a high potential for the first single release. The interest for Frank's new album "The Truth Vol. I" is great. Many listeners are asking for information about this album. Now the waiting has an end and I can promise you it was worth to wait.